Polanco-Abreu made friends quickly in the U.S. House and throughout Washington, D.C., but as Resident Commissioner he lacked legislative power and voting privileges. The island press described his position as “little more than that of a ‘cost-plus’ lobbyist with the right to hang his hat in the House Office Building.”27 Just two months into his first session, Polanco-Abreu said, “It would be worth-while … to review the concept of the Resident Commissioner.”28 His frustration at being unable to vote on the floor continued to plague him throughout his House tenure. 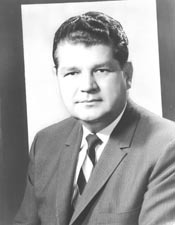 He sat on committees with jurisdictions relevant to Puerto Rico’s major legislative concerns—Agriculture, Armed Services, and Interior and Insular Affairs—and although he supported President Lyndon B. Johnson’s Great Society programs, Polanco-Abreu was limited to a supporting role because of his inability to vote. Polanco-Abreu compensated for his lack of voting privileges by testifying frequently before House and Senate committees. Because Polanco-Abreu knew the value of education, one of his main goals was to improve the island’s school system. He helped procure millions in funding for local schools, predicting that the Elementary and Secondary Education Act of 1965 would affect Puerto Rico more dramatically than any previous education bill.32 During a hearing on a 1966 education bill, he observed that education could help lower crime. “Our war against crime must be waged not with clubs and guns, but with books and tools,” he said.33 Later, when Congress considered reforming the Social Security system during the 90th Congress (1967–1969), Polanco-Abreu implored his colleagues to remember that Puerto Rico’s residents were U.S. citizens and required the same protections as those on the mainland. 1“Yo no voy a Washington a caza de prebendas ni de bienes materiales. Voy a Washington como ciudadano de primera clase, a defender los derechos de mi pueblo y a servir a la causa de la democracia.” Luis E. Agrait Betancourt, “La educación política de un Comisionado Residente,” in Hector Luis Acevedo, ed., Santiago Polanco Abreu: Compromiso y verticalidad en su lucha por Puerto Rico (San Juan: Universidad Interamericana de Puerto Rico, 2010): 383–384. Translated as “The Political Education of a Resident Commissioner,” by Translations International, Inc. (October 2011). 2“Y Anita, la mamá de Chaguín.… El padre de Santiago Polanco Abreu, don Santiago Polanco González.” José Enrique Ayoroa Santaliz, “El entorno familiar y emocional del joven Chaguin Polanco,” in Acevedo, ed., Santiago Polanco Abreu: Compromiso y verticalidad en su lucha por Puerto Rico: 91, 93. Translated as “The Family and Emotional Background of Young Chaguin Polanco,” by Translations International, Inc. (October 2011). See also Juan Manuel Ocasio, “The Man Called Polanco,” 2 February 1964, San Juan Star Sunday Magazine: 8. 3Alan Lupo, “A Jibaro in the Halls of Congress,” 25 February 1965, Baltimore Sun: 18. 4Manny Suarez, “Polanco Abreu Apparently Kills Self,” 19 January 1988, San Juan Star: 1. “Durante la Segunda Guerra Mundial, Polanco Abreu inició dos etapas de importancia personal, obtuvo el grado de Licenciado en Derecho en 1943 y casó el año siguiente con Viola Orsini.” Ruben Arrieta, “Un doloroso aniversario,”19 January 1988, El nuevo dia: 7. Translated as “A Painful Anniversary,” by Translations International, Inc. (October 2011). 5Congressional Record, 89th Cong. 1st sess. (28 April 1965): 8744. 9A. W. Moldonado, “Record P.R. Budget Goes to Legislature,” 15 January 1963, San Juan Star: 1; “Polanco—Prospects Bright,” 18 January 1963, San Juan Star: 15. 11Eddie Lopez, “Ramos Antonini, 64, Dies Suddenly,” 10 January 1963, San Juan Star: 1. 12Eddie Lopez, “Key Topic at Capitol: Who’ll Succeed Ramos?” 11 January 1963, San Juan Star: 1; A. W. Maldonado, “The New Leader,” 13 March 1963, San Juan Star: 13. 13A. W. Maldonado, “Polanco Abreu Voted New House Speaker,” 18 January 1963, San Juan Star: 1. 15A. W. Maldonado, “Munoz Did Not Take Sides in Speaker Election,” 19 January 1963, San Juan Star: 4. 16Margot Preece, “Polanco Abreu Has Firm Grip on House,” 2 February 1963, San Juan Star: 7; Nory Segarra, “Speaker’s Wife Trained in Politics But Her Main Job Is Their Home,” 28 January 1963, San Juan Star: 10. 17“Polanco Clarifies Remarks about Practice of Law,” 4 April 1963, San Juan Star: 3. 20Normal Gall, “‘Social Redemption’ Confronts Puerto Rico—Polanco Abreu,” 6 February 1963, San Juan Star: 3; Margot Preece, “House Sends Record Budget to Senate,” 22 May 1963, San Juan Star: 3; “A Bigger Budget,” 22 May 1963, San Juan Star: 15; Margot Preece, “Legislature Convenes; Vote Law Change Due,” 14 January 1964, San Juan Star: 1. 21Margot Preece, “House Speaker Gives Details of Nominating Convention,” 15 August 1964, San Juan Star: 1. 22A. W. Maldonado, “What Really Happened: Inside the Popular Convention,” 30 August 1964, San Juan Star Magazine: 3. 23“Polanco Abreu: ‘I’m Not Upset,’” 26 August 1964, San Juan Star: 3. 24Walter S. Priest, “What Lies Ahead for Polanco?” 15 November 1964, San Juan Star Sunday Magazine: 3; “P.D.P. to Orientate District Chiefs,” 25 August 1964, San Juan Star: 6. 25“Popular Leaders Launch Attacks on Republicans,” 30 January 1964, San Juan Star: 3; “The Political Platforms: Popular Democratic Party,” 2 November 1964, San Juan Star: 25. 26“The Campaign Trail Today,” 2 November 1964, San Juan Star: 3; Eddie Lopez, Frank Ramos, and Tomas Stella, “P.D.P. Rolls to Another Landslide Win,” 4 November 1964, San Juan Star: 1; “Election Statistics, 1920 to Present,” http://history.house.gov/institution/election-statistics/election-statistics/. 29Hearing before the House Subcommittee on Oilseeds and Rice of the Committee on Agriculture, Rice, 89th Cong., 1st sess. (11–13 May 1965): 167–168. 30Congressional Record, House, 89th Cong., 2nd sess. (16 May 1966): 10584–10585; Congressional Record, House, 89th Cong., 2nd sess. (17 May 1966): 10850. 31Congressional Record, House, 89th Cong., 2nd sess. (24 May 1966): 11274–11275. 32Congressional Record, House, 89th Cong., 1st sess. (24 March 1965): 5764. 33Hearing before the House Select Subcommittee on Labor, Committee on Education and Labor, Manpower Development and Training Amendments of 1966, 89th Cong., 2nd sess. (2 June 1966): 32–33. 34Congressional Record, House, 90th Cong., 1st sess. (24 July 1967): 19870. 35Henry Giniger, “Three Rivals Divide Ruling Party in Puerto Rico,” 22 April 1968, New York Times: 68. 36James McDonough, “PDP Candidates Continue on Trail: Polanco,” 8 July 1968, San Juan Star: 3. 37James McDonough, “Polanco: I’ll Gain at Convention,” 7 July 1968, San Juan Star: 3. 38James McDonough, “Polanco’s Campaign,” 10 July 1968, San Juan Star: 21; James McDonough, “Polanco Kisses Off Sanchez’ Chances,” 11 July 1968, San Juan Star: 3. 39Henry Giniger, “Puerto Rico Party Denies Governor Renomination,” 22 July 1968, New York Times: 32. 40James McDonough, “Polanco Mentions ‘Sacrifice’ in Renomination for Post,” 22 July 1968, San Juan Star: 3. 41“Election Statistics, 1920 to Present,” http://history.house.gov/institution/election-statistics/election-statistics/. 43McDonough, “Polanco: I’ll Gain at Convention.” In the days following his death, the press reported that Polanco-Abreu was believed to have taken his own life. Acevedo, Hector Luis, ed. Santiago Polanco Abreu: Compromiso y verticalidad en su lucha por Puerto Rico. San Juan, P. R.: Universidad Interamericana de Puerto Rico, 2010. "Santiago Polanco-Abreu" in Hispanic Americans in Congress, 1822-2012. Prepared under the direction of the Committee on House Administration by the Office of the Historian and the Office of the Clerk, U.S. House of Representatives. Washington: Government Printing Office, 2013.